I haven’t replied to mail in ages…! I’ve been so busy with WonFes things that I’ve neglected the letter corner for two months! I’m sorry to all the letter writers! I’ll get right on to them now!! Hello, this is my first mail to you. I’m a girl that’s been collecting figures for about three years now. Thanks for all your hard work with this years Winter Wonfes! Unfortunately I didn’t get to go to the event itself but I did manage to catch the afternoon and evening parts of your live broadcast. The afternoon section was really fun to watch, so I hope there will be another section like that one next time! Thanks for a great WonFes! The live broadcast was also great to watch! Of all the new products announced I find myself wanting a bunch of Nendoroids the most. There were a couple of scale figures I was hoping to see at the event that never seemed to appear… I hope it’s just that they weren’t ready yet! Hello, and thanks for the great WonFes live broadcast. A live broadcast like that is really nice for people like me who couldn’t make it to the event itself, so I do hope you’ll continue to do them in the future. It was a really interesting watch! Thanks again to everyone who attended WonFes or watched the live broadcast! Plus I don’t want to forget special thanks to those who greeted me at the booth… I’m sorry I couldn’t stop and chat for longer… but I was really glad to meet everyone! Plus I got some chocolates that were absolutely delicious! We’ll be sure to have some more fun ideas for the next WonFes… which is only six months away!! Oh, and don’t forget GSC is nearly at it’s 10th anniversary!! She’s my favorite!! She’s absolutely adorable! The first time I saw her it felt like an arrow pierced through my heart!! I really want a Nendoroid!! I’ve even had a dream once where I was able to display all of Crypton’s Vocaloid characters together at once… please help it come true! I’ve actually received a load of mail asking for a Nendoroid of Me-chan… and I’ll definitely send the thoughts through to the rest of the team…. but unfortunately I can’t promise anything just yet. Sakura Miku was so cute I thought I was going to explode when I saw her…. I’d love to go to Mikupa, but it’s on the 9th of March which is also the graduation announcements at my university! What a cruel twist of fate! There is no way I can go to both of them!! Is there any hope that we will see a full Nendoroid version of Sakura Miku!? I want her to be blooming in my collection! I hope my apologies will suffice… I’m sorry! I hope you’ll be filling up the figma and Nendoroid Touhou collection with more characters! This would be the ideal line-up for me, so if it were to come true I’m fairly certain I’d buy loads of them out of happiness!! I keep a large collection of GSC’s Nendoroids at home, but I’ve recently noticed that Phat! Company has also started to create Nendoroids for sale now. Will the face parts from makers other than GSC still be compatible with GSC’s Nendoroids? I love to exchange expressions between GSC’s and Phat! Company’s Nendoroids. I went and asked Uchitarou from Phat! Company! Without a specific product name mentioned he couldn’t say for sure, but generally speaking the Nendoroids are made to have exchangeable expressions with other GSC Nendoroids! However sometimes there are cases where things need to be changed in production, so not ALL Nendoroids will have exchangeable expressions. A question regarding one of Phat! Company’s Nendoroids – will Akito Takagi’s headphones be removable? Sorry for asking about another companies figures… if you don’t know then don’t worry about it! Time to go ask Uchitarou once more! Time to bring up a rather difficult topic… the other day I found a Nendoroid that I am fairly certain was a pirated version of the original. I’ve never seen the Nendoroid on your “Pirated Goods” page on the site so I figured I should bring it up. Should I mention things like this to GSC when I find them? Should I send a picture of the Nendoroid I found? Thank you for informing us. We try to keep people informed about pirate versions as much as possible so you don’t end up with a cheap substitute for a great figure. If you find a figure you believe to be a pirated edition then please send a mail through to support. If you can send images along with the report then that will only be better, but even if you can’t let us know! Today I’m mailing you about figure display cases, or at least how exactly one displays their collection of figures. I’m sure it’s a problem that plagues a number of collectors, so I thought I’d ask you and the GSC staff how you display your figures. I went around and took some quick photos of how the female staff here at GSC are displaying some of their figures! [Support Team: Yukinon] Using di:stages to create more space! [Management: Kiku-chan] The Mickey and Minney are made by her! 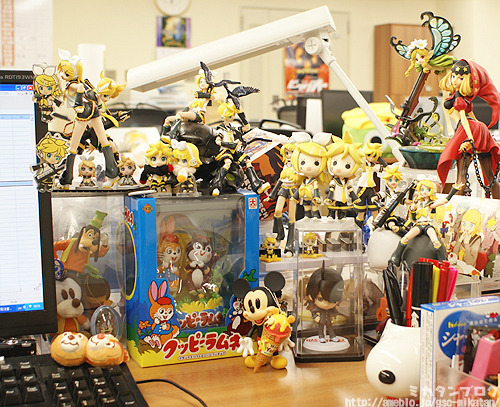 [Executive Office: Miyuki-san] She uses Hina-doll platforms to make all the figures visable! I hope you were able to get some ideas from the pictures! It’s perfect for making valentines chocolates! Unfortunately I can’t make it to Sapporo so I’ll be ordering via mail order. She will be delivered to you in June! Sorry for the wait! Make sure to leave some freezer space open! I look forward to your blog updates everyday! My question for you is simple: Why are there some products that never feature on your blog? Or can’t you say? Another reason is that various other companies are starting up their own blogs now and obviously it’s more important for them to feature their own products before I get ahold of them. I do of course sometimes get the honour of upping a review of other companies products, normally by request of them or by me specifically asking to do so. It all comes down to whether the time can be found or not. I do try to do enough varying figures so that everyone will be happy! I haven’t mailed you in awhile so I decided to send this photo through. Personally I’m very proud of this one. It really looks like she’s walking!! It’s a simple photo yet the effect is amazing! I was passing by the area with my friend Leonov and we decided to recreate the scene from the Steins;Gate! I have finished the PC version of Steins;Gate, and I’m fairly certain that any fan, like me will give this photo a smile! Thank you for the joint effort! It’s nice to see Nendoroid fans work together for a common goal! All the ones I see keep focusing on her being cute, so I decided she needed a picture that brought out her true personality. It’s quite fun trying to photograph a different kind of theme like this, I keep learning more and more about photography! The lighting is perfect for her! Excellent work!! It really gives her that kind of demented edge that is part of her personality! The clear wings seem to be a different color due to the lighting as well! It’s beautiful! How was your Valentine’s day, Mikatan? …. well that’s what I thought at first, but then I got home from school and found that Miku had bought me some heart candy! This pictures balance is perfect! And HMO Miku suits the role so well!! This is definitely a photo I can learn from! The Winter days just never seem to come to an end so I decided to take a photo to warm up with. She’s so cute! I want to curl up and sleep beside her! The open laptop, two cushions she is lying on, and the light coming in from the window… as always your photos are incredible!! You were also part of the collaboration for the Stein’s Gate photo above! Flan-chan seems to be having fun, so that’s what counts the most! Plus you captured the wings excellently! The Haruhi boys dance the Perfume, “Nee” dance! It’s amazing how close it looks to the real dance! Thank you! I can’t wait for what your blog has in store this year! Wait… It’s already March! But either way this is an amazing photo! By using an oblique angle and putting Reimu higher than the bunny it makes it look like she’s floating! Brilliant! Hello, I’m an avid reader of your blog. I was going to enter this into the photo competition but only found out afterwards it was only one entry per person. Darn. I think if I took her in she’d eat me out of house and home! I will be sure to put in some extra effort for you!! My Mickey Mouse finally arrived! He’s so cute that I had to start playing with him as soon as I got him! Thinking noone else would think to do so I took him to a certain place for a quick photo! I’m not sure if you’ve seen something like this just yet, but if you haven’t then here’s a picture of him! I actually didn’t know about this series… but I did a quick search with Google-sensei and found some images… even the design on the kimono is amazing! Did you use decals? That brings us to an end of this Kuroyagi-san’s Letter Corner! Thanks to everyone who sent me mail! And as always I’m looking for more mail to put up on the blog! If you have anything you want to tell me, any images you want me to see ot you just want to discuss the weather let me know! I’ll be waiting for your mail!